“If we don’t act now we can wave goodbye to Portsea Island” – Portsmouth councillors unanimously declared a climate emergency in the city. In what was described as an ‘historic act’ Portsmouth City Council today vowed to tackle climate change to the best of its ability including a pledge to achieve net zero carbon emissions by 2030. The notice of motion was put forward by Labour members Councillor Judith Smyth and Cllr Tom Coles following lobbying from campaigners Extinction Rebellion and the city’s Green party, and received applause and support from all councillors. During full council Cllr Smyth urged her peers to back the pledge. “As many of you know I babysit my grandaughter two days a week and it is with her in my heart that I urge you to vote for this. “I hope we can declare a climate emergency and ask other businesses to sign up. “Over the past decade I’ve been particularly concerned with the Southsea sea defences as well as the defences for Portsea Island as a whole. “Regarding rising sea levels I have become very worried in the past few weeks. “It has recently been reported that temperatures on the island of Spitsbergen in Norway have risen by 4C in 40 years. And winters there are now 7C warmer than they used to be. For activist and Green campaigner Tim Sheerman-Chase the support was promising. 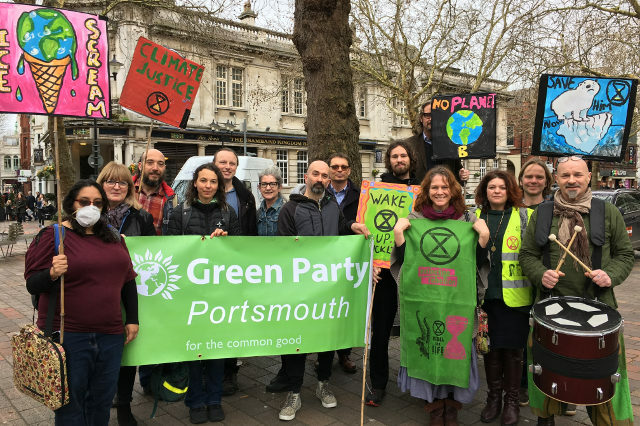 “It’s great news that Portsmouth City Council has declared a climate emergency. “The target to be zero carbon by 2030 is very ambitious and I am concerned whether sufficient measure will be taken toward achieving it. This will also be a big change to people’s travel habits and will hopefully improve everyone’s health due to better air quality. 4 Comments on "Portsmouth City Council declare Climate Emergency"
To those paying attention, he ticking of the extinction countdown clock is louder than the brexit one.